Welcome to The Radstock to Frome Railway Trust and the Radstock to Frome Railway Project. 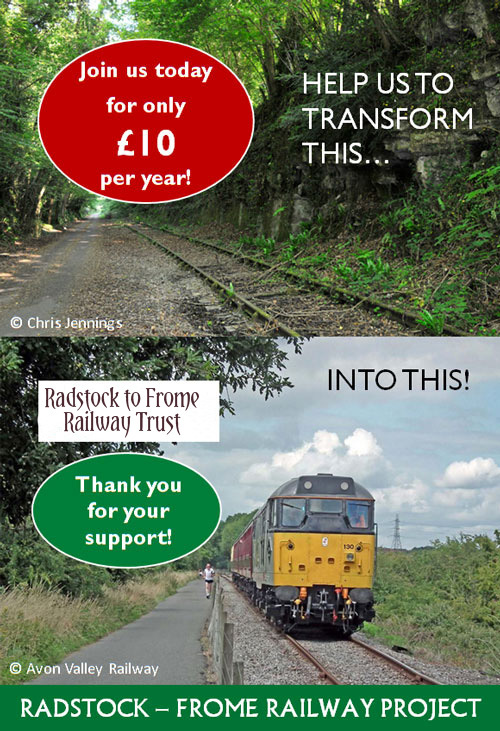 We are a charitable organisation with the primary aim of assisting the reopening of the redundant railway line between Radstock and Great Elm (near Frome), with the aspiration at a later stage to extend the railway back to Frome junction and reconnect with the national rail network. This is a community interest venture, and in order to succeed need your support. We are currently discussing the project with other interested parties to maximise the support and our capabilities to make a success of this project. Radstock is a town has a fine industrial heritage and a bright future ahead. The Radstock to Frome Railway Trust is committed to assisting the opening of the railway as a valuable resource for the community. A designated section of the former railway land (inside Area 3) has been set aside for the possible reinstatement of a rail link there. Our organisation will maximise Radstock’s potential as a tourist destination, situated between and near the historic cities of Bath and Wells, and play an instrumental part in reviving the local economy. However, we are unable to do all this without your help and kind generosity. On the 2 nd October 2014 The Somer-Rail Trust was registered by the Charity Commission as a charity in England and Wales (1158749). As a group we are steadily increasing in number and would appreciate your help and support moving forward with this project, if you can assist us please don’t hesitate to get in touch. Our Facebook/Twitter group pages are an excellent way to share memories, and view photographs (old and new) of the line. The Trust’s quarterly newsletter ‘Along the Lines’ includes all the latest developments and a background history of the railway. Thank you for your interest in the Radstock to Frome Railway Project.